Select from our large variety of custom cut, beautiful granite in your residential or commercial kitchen, bathroom, lobby, patio, or any other area you may have the need for. Quartz is quickly becoming the new "thing" for kitchens, baths, and other areas. Very durable while still holding its natural stone beauty. 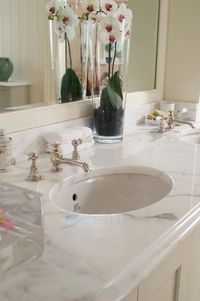 Beautiful, soft marble is a classic we all can enjoy. We offer custom cuts and installation for any area in your residence or business setting.